These five baskets are part of a new series that I’ve been working on for the past few months. They are based on a basket by Donna Choke from the Chehalis tribe in the Pacific Northwest. I saw a version of it that a good friend of mine had made, and fell in love with its loose, appealing style. And I also fell in love with its name. They are called Crazy Lady Baskets! My versions are actually somewhat more refined and labor intensive than the one I had seen, but nonetheless they are still quite funky and playful. 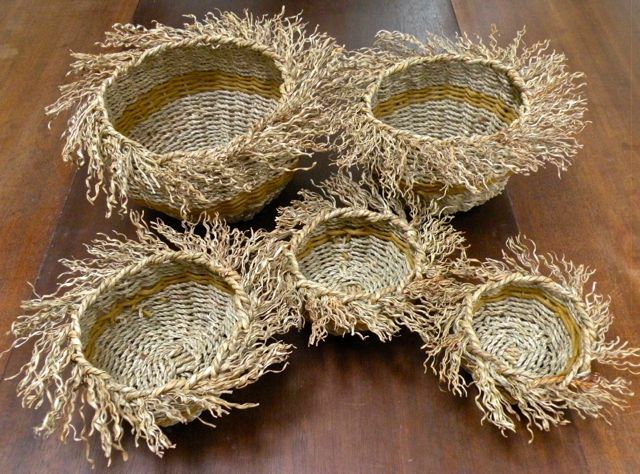 The basic idea is to make a basket from seagrass and then to fray the ends of the spokes at the end. The variations seem endless and I feel that I’m just beginning to explore them. I am excited about this new direction, because even though they are based on a tribal design, they really feel like my baskets, something that I’ve been working toward for a long time. My attempt is to make a basket that is functional, but has enough presence to stand on its own as a decorative object. They are really satisfying to create, and I am having a great deal of fun making them. Far from turning me into a Crazy Lady, weaving these baskets calms me down, centers me, and makes me a very Happy Lady.